As adults grow older, they may develop slower reaction times, difficulty with visual acuity, and other cognitive issues that put their health at risk every time they get behind a steering wheel. Family caregivers need to know when it’s time to take the keys away from their loved ones and how to do it delicately. Below are some of the most common signs it’s time for an aging parent to stop driving. It’s dangerous for drivers to forget to use their turn signals or run through a red light, but this is common on occasion. However, seniors who repeatedly ignore traffic lights and forget to use traffic signals could be developing cognitive impairment and need to stop driving immediately. Don’t dismiss this as normal behavior, especially when it happens on a regular basis. It could start off as missed traffic stops and lead to serious accidents. Cognitive impairment could also cause your loved one to become disoriented and increase the risk of getting lost by taking the wrong route home or to places he or she frequently visits. One of the many ways to ensure your loved one’s safety is to hire a professional caregiver. Families shouldn’t have to worry about finding reliable senior care. Montgomery Home Care Assistance is a leading provider of elderly home care. We offer a proprietary program called the Balanced Care Method, which uses holistic methods to promote senior health, our caregivers and Care Managers are available 24/7, and all of our in-home care services are backed with a 100% satisfaction guarantee. The gas and brake pedal have different functions, and when your parent cannot differentiate between the two, it may be time to take his or her car keys away. While riding in the car with your loved one, you should also watch how he or she switches between the pedals. If you notice your loved one lifting his or her legs to move the pedals instead of pressing with the toes and keeping the heel on the floor, this could be a sign his or her leg strength is decreasing. Your loved one will need to have good muscle and joint health to operate a vehicle, and waning leg strength could be a warning sign he or she needs to stop driving. 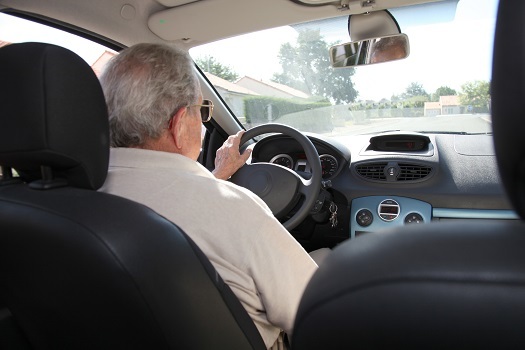 Keeping up with the pace of traffic is often difficult for seniors, but instead of admitting they have difficulty with fast-paced changes, they may become agitated and irate. Monitor your loved one’s reactions during these times. If he or she honks the horn, uses bad language, or passes drivers up, it may indicate that he or she cannot keep up with the flow of traffic. Straddling and weaving lanes could be dangerous, putting your loved one and other drivers at risk. Seniors can face a variety of challenges as they age, many of which can be mitigated with the help of professional in-home caregivers who provide high-quality home care. Montgomery families trust Home Care Assistance to help their elderly loved ones age in place safely and comfortably. Inspect your loved one’s car regularly to search for signs of accidents. A minor dent may not seem like a big deal, but there could be an underlying health issue that is making driving difficult for your parent. If this issue isn’t treated, your loved one might get in a major accident. In addition to recent dents and scrapes on the car, make sure to examine areas and objects near the home, such as the garage door, driveway, mailbox, and fences. If you notice any recent damage to these objects and areas, it could be a warning sign of unsafe driving and you should take your loved one to the doctor immediately. Your loved one’s medical provider can perform examinations and determine if he or she should stop driving temporarily or on a permanent basis. Caring for a senior while managing your personal responsibilities can be incredibly challenging. If you’re the primary caregiver for a senior loved one in Montgomery, respite care is available when you need time away from your important caregiving duties. At Home Care Assistance, our respite caregivers are available 24 hours a day, 7 days a week to help your loved one manage everyday tasks in the comfort of home while you have the chance to take a much-needed break. To customize an elderly care plan for your loved one, give us a call at (334) 593-3988.